As your business continues to thrive and grow, your shipping needs will undoubtedly become more and more complex. Managing all of the shipping carriers your company uses, as well as trying to track and reduce shipping costs associated with these tasks can be challenging enough. If you have multiple employees involved in your company’s shipping activities those challenges can be multiplied exponentially. Major shipping carriers like FedEx and UPS will only assign your company a single account. If multiple employees are working with that single account it can extremely difficult, if not impossible, to track the shipping actions and decisions of your company. The roots of costly issues can’t be pinpointed so it makes corrective action and the prevention of future mistakes difficult. The solution to the challenge of reducing shipping costs comes by way of a robust, multi-carrier shipping solution like SendPro from Pitney Bowes. This type of shipping solution allows you to set up individual user accounts with rights and limitations that can be pre-determined. For example, spending limits can be set up for users, and that type of control provides a level of management and oversight that can save a lot of money. Plus, you can rest easy knowing that if you choose to implement a multi-carrier shipping solution in your business, you can easily integrate your existing FedEx and UPS accounts. That means you’ll continue to get those contract rates and further reduce shipping costs. How will an account management and reporting solution help my company reduce shipping costs? An account management solution will allow you to consolidate all of your shipping costs into one report. The end result is a smoother functioning shipping department and a far easier budgeting process. SendPro makes it easy to manage your shipping expenses. In the past, businesses had the challenging task of tracking all of their shipments with the three major carriers separately. Now, SendPro will generate a single report, showing users all of the activity with the three major carriers in one location. This all but eliminates the tedious task of record-keeping and report consolidation because the system does it for you. Another great benefit of the SendPro solution is that it easily integrates with many other existing software packages, like your accounting solution. That means you can easily streamline your invoicing by exporting files from SendPro and uploading them directly into your accounting software. Ultimately, that will reduce the likelihood of costly accounting errors and it will reduce shipping costs associated with labor because it eliminates a lot of figure crunching and migrating of numbers between multiple systems. The SendPro solution from Pitney Bowes also makes shipping management easier by allowing you to designate staff and set user permissions. A growing business usually means that you’ll have more people involved with your shipping processes. It can even mean that people are shipping from multiple locations, and that can be a logistical nightmare when it comes to managing, tracking and ultimately reducing shipping costs. The SendPro solution simplifies that challenge by allowing supervisors to manage who actually uses the system and which tasks they are allowed to do. The end result is far greater control and more accountability of shipping costs. All of the activity, from all locations and users, can be consolidated into a single report. When budget time rolls around you can easily look at your company’s shipping activity by client, user and department. If your staffing needs tend to fluctuate, you don’t have to worry about it affecting your shipping department. SendPro makes it easy to manage usage in order to meet your business needs. If you need more people to use the system it’s quick and easy to add them to the database and set up their user permissions. What else can the SendPro solution do? Simplifying account management and consolidating reports aren’t the only ways SendPro can help your company reduce its shipping costs. SendPro can help you choose the right carrier in the first place by quickly comparing the services provided by USPS, FedEx and UPS. It will ensure that you go with the most cost effective option every single time. This is a huge burden lifted, especially when you consider all of the rate changes that tend to go into effect at the beginning of each year. The SendPro solution can also help you reduce shipping costs by allowing you to more closely monitor sending activities, specifically the tracking of shipments. In the past, it’s been a time consuming and daunting task to track shipments across multiple carriers with multiple tracking numbers. SendPro easily tracks all information across all carriers, bringing peace of mind to both your company and the recipient, as well as helping you lower shipping costs. Tracking the package across multiple carriers can be challenging enough, but tracking the costs associated with using all of those handlers is an even more difficult task. Historically, a company might have to compile a stack of receipts, invoices and carrier forms to fully document the cost of a single shipment. With SendPro’s consolidation capabilities, you can see all of the shipping costs (for multiple carriers) in one place. Plus, you can easily generate an easy to follow report when it comes time to send invoices to your clients. The SendPro solution comes with more than just time-saving software and the potential of reducing shipping costs. You also get some physical equipment that is designed to make your shipping process even more worry free. With the SendPro solution, you get an integrated scale that’s designed to accurately weigh and measure packages and envelopes. This will prevent you from overpaying for postage–one of the most costly expenses as reported by many businesses. You also get a robust printer so that you can easily print out correct and professional labels. Finally, SendPro will monitor all of the shipping activities and relevant costs for each recipient and client. Information like tracking numbers, services and costs will be tracked for each client and each major carrier. That kind of overview will allow your business to better understand your shipping functions and allow you to make smart financial adjustments as necessary in order to reduce shipping costs. Regardless of the size of your business, The SendPro solution provides both software and physical equipment that will keep your organization running and looking like a professional, well-oiled machine and it will help your business reduce shipping costs in the first place. 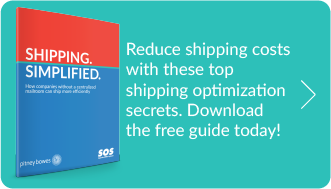 Find out more about how to make shipping easier AND reduce shipping costs at the same time with this ebook: Shipping Simplified.